ROCKHOPPER, MACARONI, MAGELLANIC and HUMBOLDT PENGUINS. SOUTHERN ROCKHOPPER PENGUINS are found at 15 breeding sites around Argentina and Chile, with a further 36 breeding sites in the Falkland Islands. Together they make up a total world population of around 650,000 breeding pairs. These breeding sites are all on offshore islands, with Isla Pinguino near Puerto Deseado (number 9 on the map) being the only site where tourists can see Rockhopper penguins in Chile or Argentina. Populations appear to be stable in Chile, and increasing in Argentina, due to rapid expansion of the Staten Island colony (number 4 on the map). The Falklands population has crashed by nearly 90% from 2,500,000 pairs to around 280,000 pairs, due to poor management of commercial fisheries (See Falklands Penguins Starve to Death). Rockhopper penguins abandoning the Falklands probably helps to explain the rapid increase on Staten Island. Rockhopper Penguin breeding sites in South America. MACARONI PENGUINS are found at 9 breeding sites around Argentina and Chile, all on remote offshore islands. Together they make up a total of about 12,000 breeding pairs, out of a world population of around 9 million breeding pairs. None of the colonies in Chile or Argentina are within easy reach of the continental mainland, making them unsuitable for tourism. Other breeding sites for Macaroni penguins are South Georgia, South Sandwich, South Orkneys, South Shetlands, Bouvet, Prince Edward, Marion, Crozet, Kerguelen, Heard, the Falkland Islands, and the Antarctic Peninsula. Macaroni Penguin breeding sites in South America. MAGELLANIC PENGUINS are found around the Atlantic and Pacific coasts of Chile, Argentina and the Falkland Islands, reaching as far north as Peninsula Valdez in Argentina, and Puerto Montt in Chile. Together they comprise a world population of around 1,800,000 breeding pairs. Populations in Chile and Argentina are increasing overall, despite declines in some of the colonies in northern Argentina related to oil pollution and tourism. The Falklands population has suffered a 90% decline over the last 20 years due to the Falklands' refusal to protect penguins from commercial fishing (See Falklands Penguins Starve to Death). 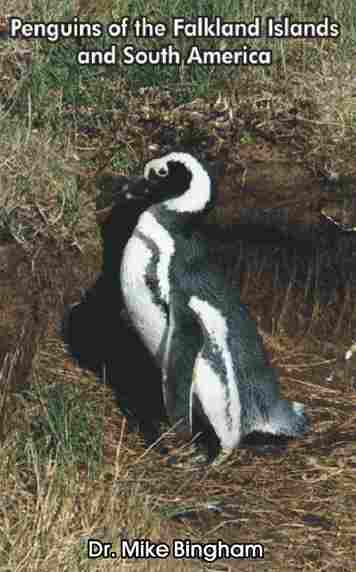 Recommended sites to view Magellanic penguins in Chile are Seno Otway and Magdalena Island near Punta Arenas, and Playa Mar Brava near Ancud on the island of Chiloe. HUMBOLDT PENGUINS are found along the Pacific coast of northern Chile and Peru, with one tiny colony further south on the Island of Chiloe. The total world population of Humboldt penguins is around 12,000 breeding pairs, with about 8,000 breeding pairs in Chile. Populations are in severe decline due to the loss of food resources caused by commercial fishing, damage of breeding sites through the excavation of guano, and introduced predators.